Morphological classification of galaxies in ellipticals (E), spirals (S), and irregulars (Irr), as introduced by Hubble, correlates with the stellar population and dust content of these systems (see figure). Ellipticals are redder than the others and (usually) show purely stellar absorption-line spectra with no or weak nebular emissions. These objects are also referred to early-type galaxies (ETGs), either if they are selected by morphology or by color/spectral-type. Furthermore, bulges of spirals (better if earlier-types) show morphological and spectral similarities with Es, so that bona fide ellipticals and bulges are both under the class of galactic spheroids. 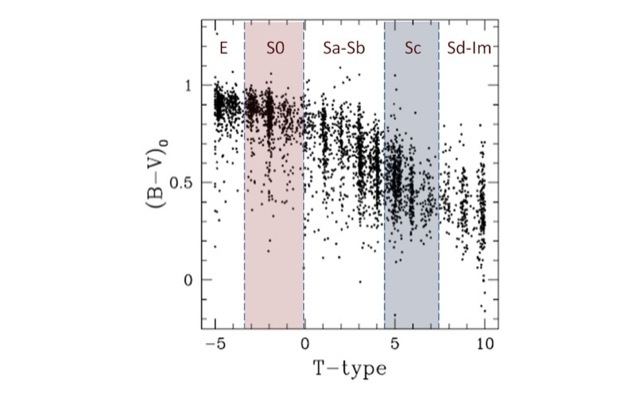 The figure shows de Vaucouleurs’ numerical T-type vs. (B - V), color corrected for Galactic and internal extinction, for a sample of over 22,000 SDSS galaxies. Adapted from Conselice, MNRAS, 373, 1389, 2006). Here we will learn how to model the photometric and spectroscopic characteristics of the various galaxy types via population synthesis tools, i.e. by means of computer programs which reconstruct the spectral energy distribution (SED) of galaxies and its evolution with time through libraries of stellar evolution models computed for a wide ranges of masses, ages, and chemical compositions (metallicity). Much progress has been made in the field during the last decades, especially thanks to the systematic production of fairly complete libraries of stellar evolutionary sequences and stellar spectra (which result from rather difficult and somewhat uncertain models of the transfer function of stellar atmospheres onto the radiation emitted by the stellar photospheres). Stellar population analysis is a powerful tool to characterize the stellar content of galaxies (for instance, to date the star formation episod/episodes) in a fashion independent of cosmological parameters. For a given cosmology, ages derived from observations in the local (low z) universe can be used to predict the properties of stellar populations of galaxies in earlier epochs, and to make robust assessments on their formation redshifts. In order to gain information on the ages of local galaxies, one might be able to establish a color, spectral, and luminosity evolution with redshift, subject to direct observational tests. Those aspects involving correlations between low- and high-z photometric properties from stellar population studies bear important consequences on observational cosmology, as they are strongly correlated with galaxy formation and evolution theories. The figure in the following page shows the color-magnitude diagram for over 22,000 SDSS galaxies with cz < 15,000 km/s (Conselice, MNRAS, 373, 1389, 2006). Early-types (de Vaucouleurs T < 0) are red squares, late types (T > 3) are blue crosses, intermediate types (0T < 3) are green triangles. Color-magnitude diagram for over 22,000 SDSS galaxies with cz < 15,000 km/s (Conselice, MNRAS, 373, 1389, 2006). The Sun. Credit: NASA (SOHO). the global structure of a star is determined by the simultaneous satisfaction of these principles the local properties of a star are determined by the global structure. where is Wien’s displacement constant. 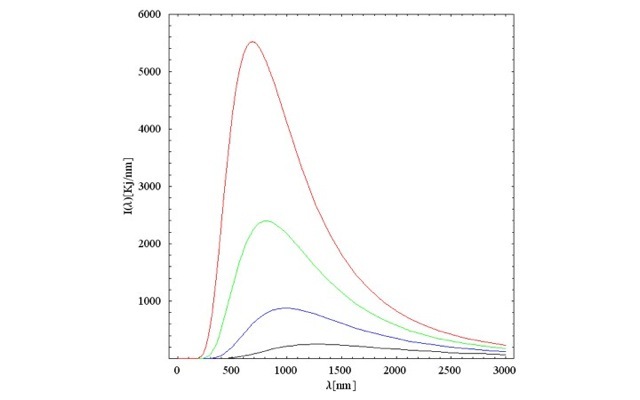 The black body emission for T = 3500 (black), 4500 (blue), 5500 (green), and 6500 °K (red). The (photospheric) effective temperature is among the primary parameters to classify a star. It is linked to some basic observables such as colors. 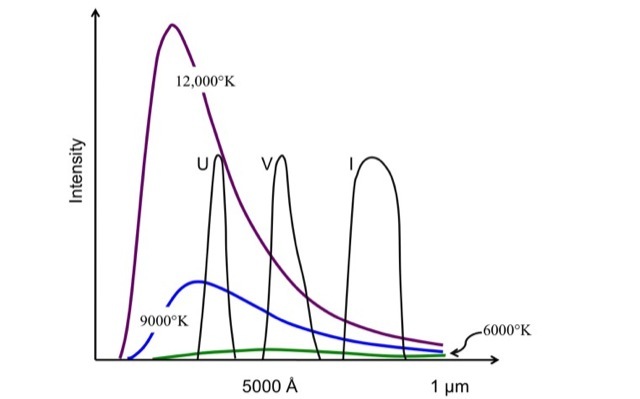 In the figure, for instance, we show how color terms, obtained by observing a star with a certain (black body) temperature through a series of optical filters, from UV to NIR, change as a function of the temperature. Higher temperature stars have bluer colors than low temperature ones. 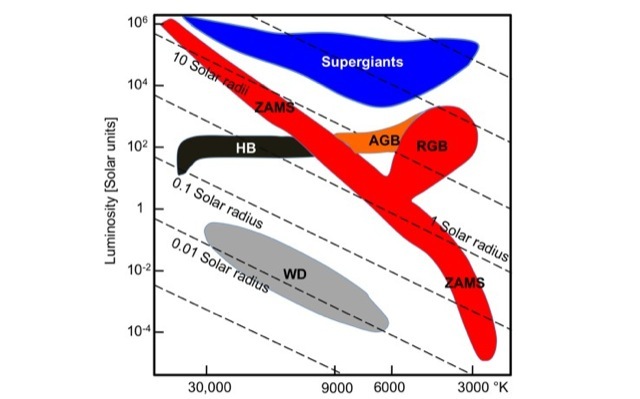 The coupling of various black body energy distributions for different temperatures with optical bands (figure) shows how the color terms can be a probe of the stellar temperatures. Black body radiation at different temperature coupled with typical optical bands. The black body radiation is only a rough approximation of real SEDs of stars. In fact stellar spectra are a rather intricate combination of a black body-like continuum (deviations are larger as temperature decreases), reshaped by several causes, with various emission and absorption features (lines and bands). 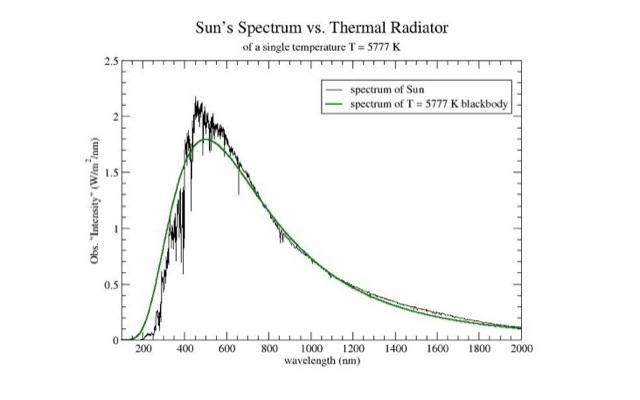 The figure shows the spectrum of the Sun against the black body radiation with T = 5777 °K. The overall radiation deviates from the Planck law, and a number of absorption and emission lines are visible. These features are characteristic of the chemical composition of the surface layers of the Sun and are linked to its physical properties. Spectral features have powerfully served to create a physical characterization of the stars. 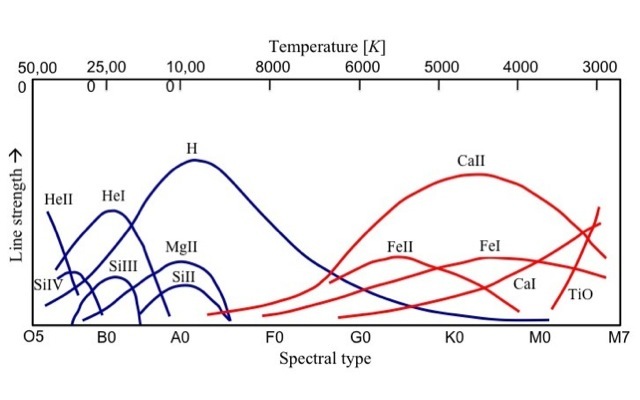 Stellar spectra classification showing the relative strength of the elements characterizing the spectrum. Even though the actual star colors perceived by an observer may deviate from these colors depending on visual conditions and individual stars observed. The sequence can be kept in mind with the mnemonic: “Oh, Be A Fine Girl/Guy, Kiss Me”. The first classes (O and B) are mainly characterized by the ionized helium, while the class A is characterized by a strong presence of neutral hydrogen (see figure on previous page). Later classes (F, G, K, M) are instead characterized by ionized metals (Fe, Ca, O etc.). Note that in the stellar chemistry, metals are all the elements heavier than helium. H and He are the main constituents of stars and are the ones formed first. The metals (Si, Mg, Fe Ca, O) have formed by fusion of lighter elements. In the current star classification system, the Morgan-Keenan system, the spectrum letter is enhanced by a number from 0 to 9 indicating tenths of the range between two star classes, so that A5 is five tenths between A0 and F0, but A2 is two tenths of the full range from A0 to F0. Other letters or roman numbers provide addition information on the pressure terms and luminosity class. 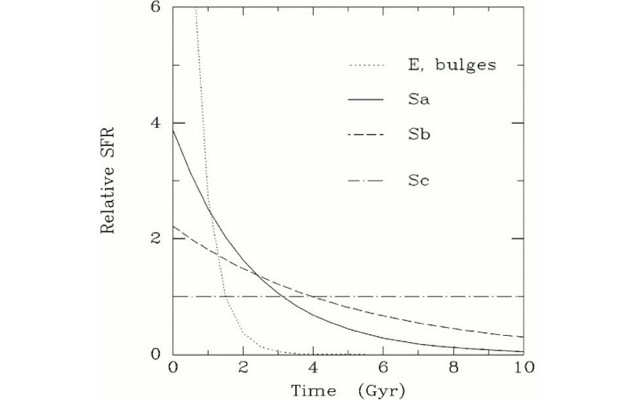 The figure illustrates better the differences among the stellar classes by the SEDs typical of the various types. The earlier classes (O and B) show a strong emission in the UV (short wavelengths) with the presence of emission lines. Already from the B5 class there is a strong decrement of the UV spectrum and a peak of the SED which move toward larger wavelengths, typical of smaller effective temperatures of blackbody. Later stellar classes are mainly characterized by absorption line spectra. The O-M sequence is also a rough sequence of stellar radii, with the diameters decreasing from the O stars to the M stars (called also dwarf stars). The Sun is a G2 star. It is sometimes called a yellow star (spectroscopically, relative to Vega), and may appear yellow or red (viewed through the atmosphere), or appear white (viewed when too bright for the eye to see any color). which states that, for a given effective temperature the more luminous is a star, the larger is its radius, (see figure). Hydrogen generally determines the nuclear lifetime of a star since it is used as the main source of fuel in the Main Sequence phase. H constitutes much of the star’s core. It turns into helium in the nuclear reaction that takes place in the hot core. where is the fraction of the total mass of the hydrogen which will be fused in helium, is the average H consumption rate, and the luminosity. As an example, the Sun’s nuclear time scale is approximately 10 billion years. Stellar temperatures, luminosities, and sizes in the Hertzsprung-Russell diagram. The relevant features of the he Hertzsprung-Russell Diagram are the following. 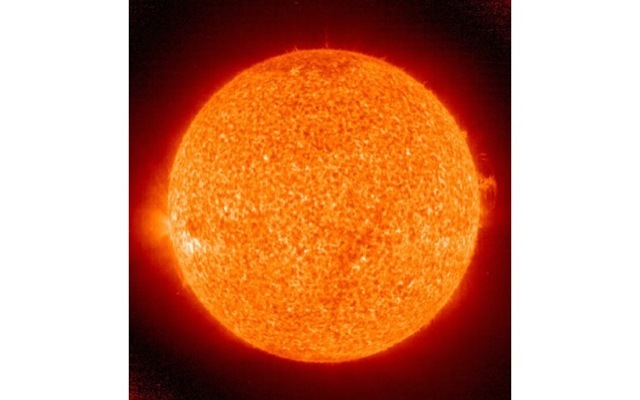 Main Sequence (MS): core hydrogen burning phase; longest phase of evolution. Turn-off: hydrogen exhausted in core, start of “interesting” evolution; for a coeval (single) population (e.g. a star cluster), it is a valid age probe. Red-giant Branch (RGB): hydrogen burning in shell around inert helium core; growth of He core. RGB tip: end of RGB phase: core massive and hot enough to ignite He-burning (the “helium flash”). Horizontal Branch (HB): core He burning; details depend on metallicity and on mass-loss in the RGB phase. Asymptotic Giant Branch (AGB): He burning in shell around inert C/O core; complicated mass-dependent evolution from here on. 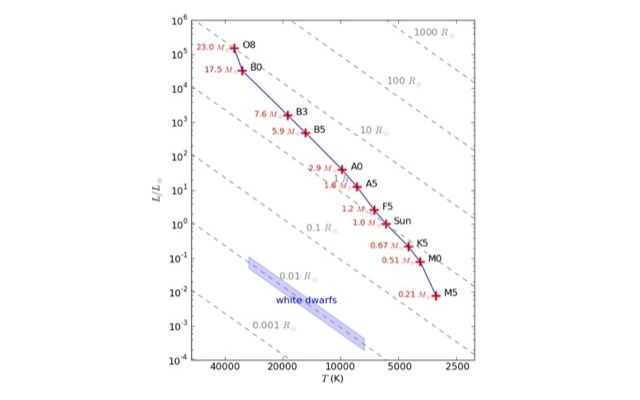 White Dwarf Sequence (WD): low-mass stars eject envelope and leave inert C/O core which cools as a WD. Supernovae: massive stars explode as SNe. Stellar temperatures, luminosities, and sizes in the Hertzsprung-Russell diagram. 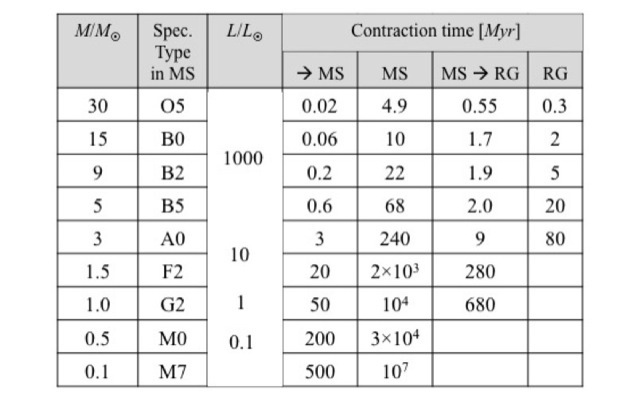 Working out the numbers for relative to different stellar masses, one obtains that, starting at the end of the contraction of the proto-star, when the nuclear reactions switch on and the star enters the Main Sequence (MS), the early spectral type (O and B), corresponding to the most massive and luminous stars, are the ones spending less time on the MS and soon moving away (e.g. ~ ) toward the Red Giant Branch (RGB). On the contrary the later spectral classes, less massive and luminous stars (G-M) are the ones that stay on the main sequence longer ( ). From the table it is clear that the older is a stellar population (e.g. globular cluster or average galaxy bulge) the later spectral types are found on the MS.
Incidentally, we also notice that the later spectral types are characterized by larger mass-to-light ratios (e.g. 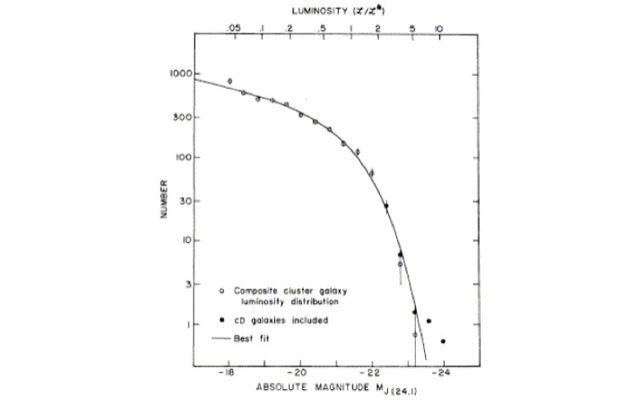 for a given luminosity the mass in stars is larger for G-M stars than for O-B ones). As we shall see, since earlier stellar spectral types are mainly found in younger, star formation dominated galaxies (such as spirals), these systems have smaller stellar mass-to-light ratio than old, non star forming objects. Lifetime of stars of various masses in the successive phases of their evolution, from protostars to Red Giants. 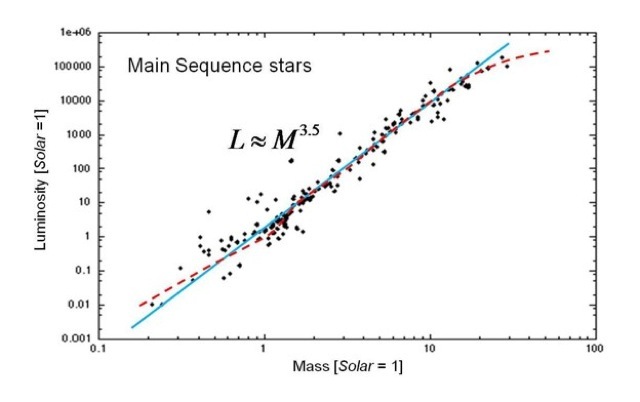 Average trend of L vs M for main sequence stars. Note the local change of slope, acting on the exponent of the power law. Data from Svechnikov and Bessonova, Bull. d'Inf. Cent. Donnees Stellaires, 26, 99, 1984. The idea of the spectral synthesis is as follows. Given a library of spectra of stars of types O to M, sum them up using the IMF as a weighting function and let these stars evolve (by upgrading the spectra to the corresponding age of the SSP). You will have the spectral energy distribution (SED), the total luminosity in the desired bands, and the stellar mass-to-light ratio (M/L) as a function of the age of your SSP. First thing to notice is that the different galaxy types are characterized by different SED which remind the different stellar spectral type. 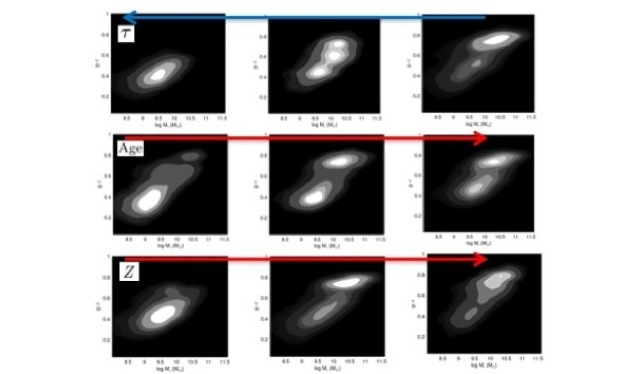 In the figure of the next page we show face-to-face the stellar spectra (middle panel) versus the typical galaxy spectra (right panel, from irregular to ellipticals, from top to bottom). is operatively defined as the number of stars with masses in the range M and M + dM, within a fixed volume in the space. It is usually worked out as a series of power laws and is proportional to , where is an exponent which sets the IMF steepness. Direct observations of the IMF could be done in local galaxies or in our Galaxy only, but indirect evidences could be done by dynamics and lensing in local and higher redshift galaxies, galactic microlensing, etc. Earlier analysis from E. Salpeter (1955) pointed predicted a favored exponent of and this function is named Salpeter IMF, showing that the number of stars is decreasing very fast as a function of star mass. Later on other observations gave different results. The most recent observations indicate that at masses larger than solar one, Salpeter slope is fairly good to reproduce the star distribution, while the number of lower mass stars is lower (e.g. bottom-light Scalo, Chabrier and Kroupa IMF). 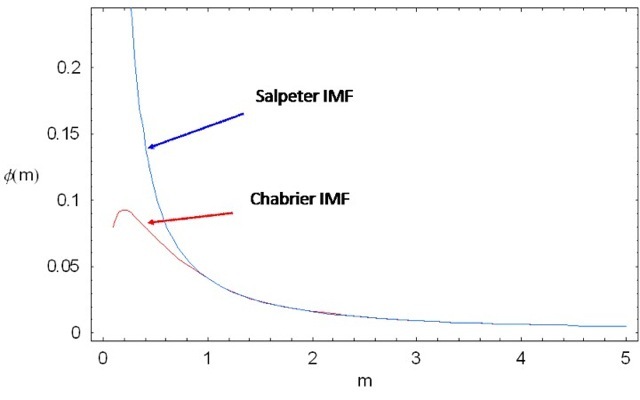 Chabrier and Salpeter IMFs as blue and red curves. In general, stars do not passively evolve with time, since dense clouds of gas can convert to new stars across the evolution of the galaxy. The simplest outputs of synthetic spectral analysis are the so called “single burst” (or SSP = single burst stellar population) models, where the star formation is assumed to happen at some t = 0, and then, the galaxy passively evolve, without any star formation activity. These models can be convolved with particular star formation rates, i.e. the formation of some amount of new stars as a function of the time, to produce more realistic galaxy spectra. The star formation rates are given in solar masses per year ( ) and generally differ with the morphological types. Elliptical galaxies have been found to form the bulk of their stars in early epoch in a short time scale, while later type galaxies (lenticulars and spirals) have a more protracted rate of their star formation. The figure shows a schematic illustration of typical SFRs for different morphological types. Generally, SFRs are usually modeled with exponential or truncated functional forms, which reasonably mimic the star formation of real galaxies. Schematic illustration of the evolution of the stellar birthrate vs. Hubble type. From Kennicutt, A.R.A.A. 36, 189, 1998. See the figure for a derivation of the law for the total (atomic + molecular) gas. Schmidt law as shown in Kennicutt, Ap.J. , 498, 54, 1998. 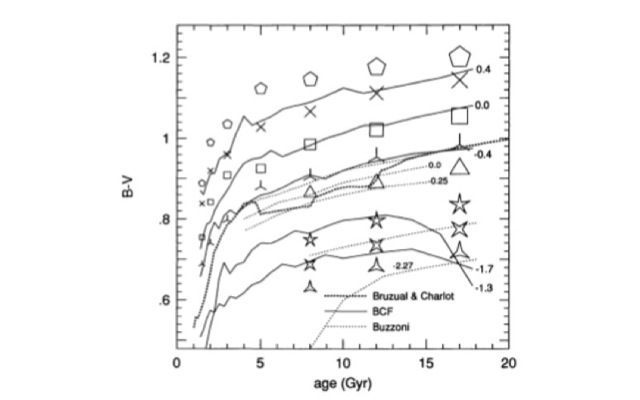 Simple Stellar Population: set of stars all with the same age, SFR, and initial metallicity, Z0. The corresponding stellar models give the evolution of stars in mass M, luminosity L, effective temperature Teff as a function of the time, metallicity, Z, and initial mass. 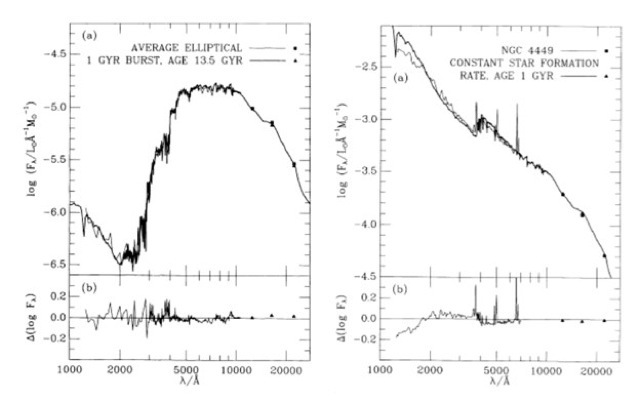 2) sum from all the stars in the HR diagram, extracted according to the IMF, to get the spectrum of the SSP. The free parameters of the models are age, SFR, Z, which can be adjusted iteratively in order to find the best match between the synthetic spectrum and the observed one. By-product are: M/L and the stellar mass of the galaxy. Two stellar models for an early-type (left) and a late-type galaxy (right) from Bruzual and Charlot (Ap.J., 405, 538, 1993). 2) a “Blue Cloud” (BC) where the bluest systems lie. Between these two regions there are intermediate-color galaxies which inhabit the so called “Green Valley” (GV); see the figure. A more accurate analysis reveals differences in the stellar properties along the diagram. On average, the galaxies younger, less metallic and with more protracted SF populate the bluer and less massive side, while the most massive and red ones are on average older and with higher metallicity and a less protracted SF (see panel in the next page). SDSS Color-Magnitude diagram for galaxies. Color-mass diagrams made with SDSS data and sliced according to growing values of duration of star formation (top), age (middle), metallicity (bottom). 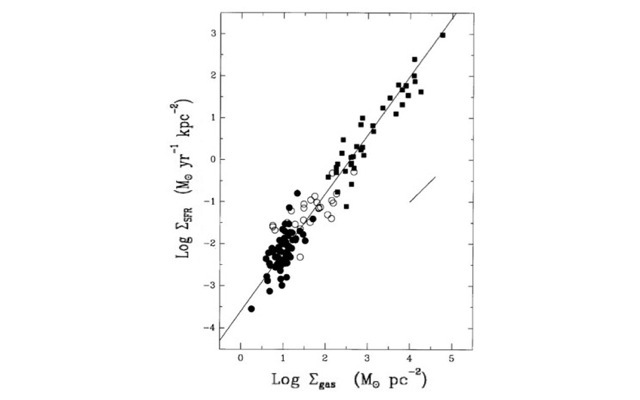 Broad-band photometry of galaxies is hardly able to distinguish between the effects of evolution (age) and those due to the amount of “metals” (metallicity). This problem is known with the name of age-metallicity degeneracy. The nature of the effect is easily understood looking at an age-color diagram built for various SSPs of different metallicity (see figure). 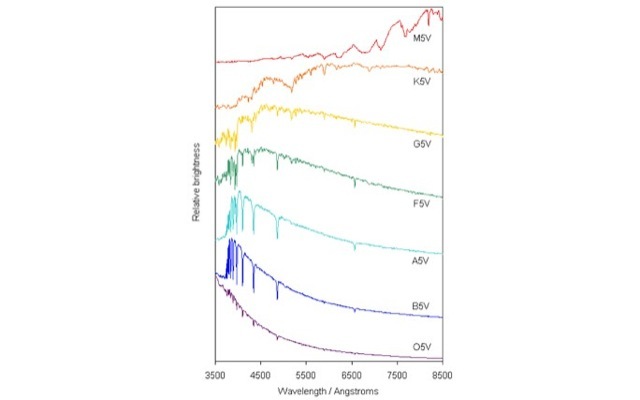 (B-V) color vs age [Gyr] for various metallicities.From Worthey, Ap.J., 95, 107, 1994.
where is the luminosity distance and the so called k-correction allowing us to convert the quantity of light measured from an object at a redshift into an equivalent measurement in the rest frame of the object. 1) Suppose we measure the distance and apparent magnitude m of all stars within some limiting distance (“volume limited sample”) within a given solid angle. 2) Convert from apparent magnitude to absolute magnitude M using the known distance D to each star. 3) Counting the number of stars with absolute magnitude between and and dividing by the volume surveyed, for different magnitude bins gives you the luminosity function. massive stars (bright) are rare. The stellar luminosity function is the basic observable for studying a population of stars. Starting from the observed luminosity function, it is possible to derive an estimate for the Initial Mass Function (IMF). The IMF is a more fundamental theoretical quantity which is related to the star formation process. 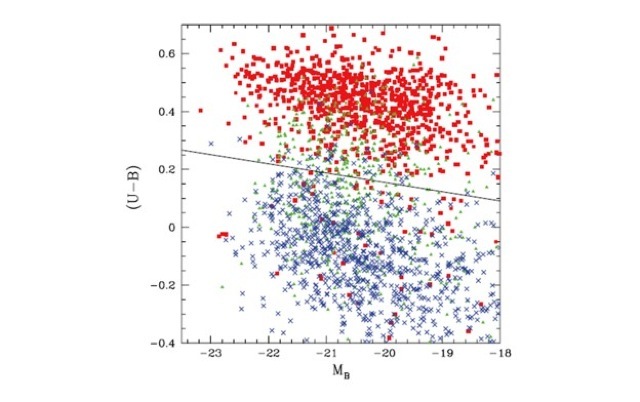 Note that the IMF only gives the distribution of stellar masses immediately after stars have formed – it is not the mass distribution as observed today. The figure shows the observed Local Luminosity Function (numbers in a sphere of 20 pc) with single stellar LF model from Kroupa, Tout & Gilmore (1993). Kroupa, Tout & Gilmore, MNRAS, 262, 545,1993. 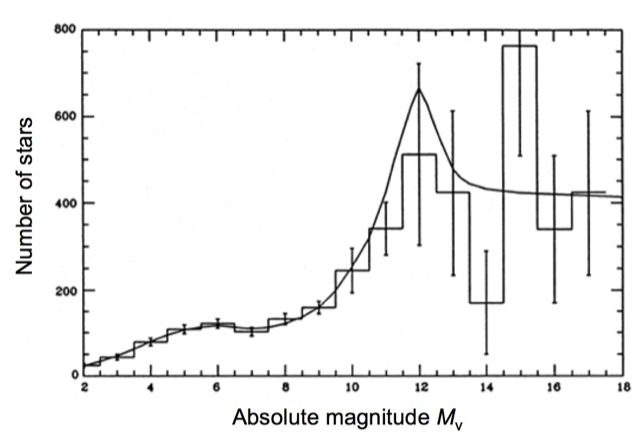 Convert from absolute magnitude to mass: here the mass-luminosity relation is needed (from the stellar structure theory, calibrated by observations of eclipsing binaries). Consider lifetime of stars: massive stars have shorter lifetimes than low mass stars. Thus massive stars are doubly rare – few are formed plus they do not live as long as low mass stars. Consider Mass Loss: for massive stars, mass loss in stellar winds means that the present mass is smaller than the initial mass. 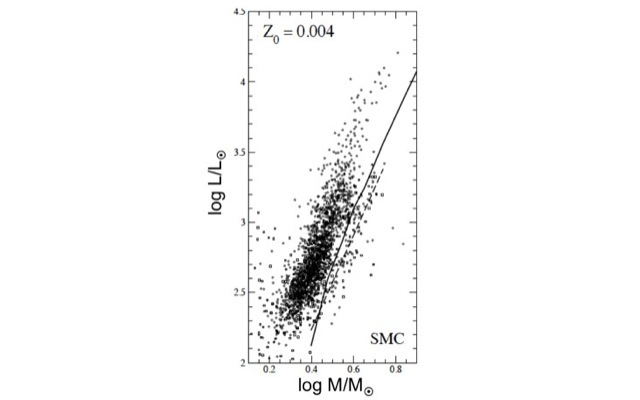 The figure shows the mass-luminosity relation derived from OGLE observations for metallicity Solid and dashed lines trace theoretical mass-luminosity relations (from Cordier, Goupil &Lebreton, A&A, 409, 491, 2003). Cordier, Goupil & Lebreton, A&A, 409, 491, 2003.
in other galaxies, especially in the distant Universe. and: respectively. Note that this MF denotes the volume-density of objects/pc3 per interval of log M.
processes transforming mass into light. LF of galaxies in Abell clusters by P. Schechter (Ap.J., 203, 297, 976). at high luminosities, as very luminous galaxies are rare. Full sample LFs have a steep cutoff due to the Gaussian LF of the luminous Spirals, S0s and Ellipticals have rising faint end due to dEs (and to lesser extent dIrr). 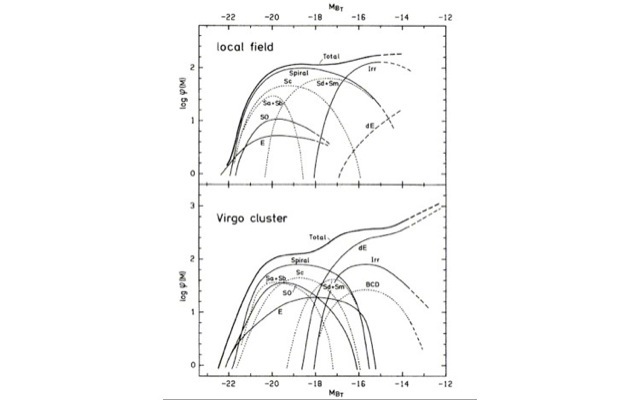 Field and Virgo cluster LFs for various galaxy types. From Bingelli, Sandage & Tammann, ARAA, 26, 509, 1988. But LF depends also on the environment since it seems that the relative proportions of each galaxy type that vary between cluster and field. In general, cluster LFs are well fit by a SF have similar and are often steeper than in the field ( ). There can be a dip/drop near furthermore there can be an excess at higher luminosities, while cD galaxies ( ) do not follow a SF and would be considered outliers in any smooth distribution. The differences of LFs between cluster and field environments usually arise from different proportions of Sp, S0, E, dE, and dIrr. 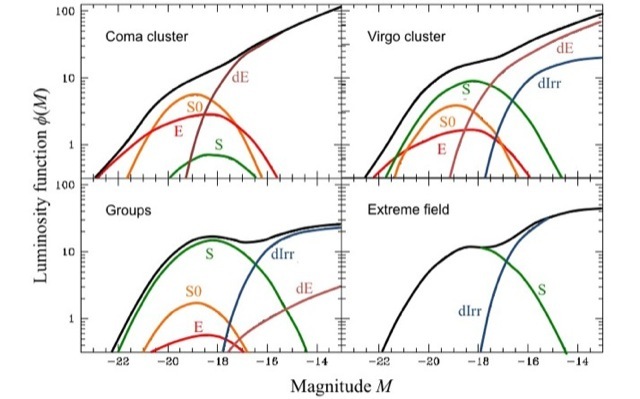 Specifically, more E, S0, dEs are in clusters, while more Spirals and dIrr are in the field, which is a consequence of a morphological dependence on galaxy density (morphological segregation). The dip at occurs at the change over from “normal” to “dwarf” galaxies. cD galaxies have clearly had a different history, probably growing by accretion in dense galactic environments. Analysis of the SDSS sample shows similar results, but cast in terms of the red and blue sequences. 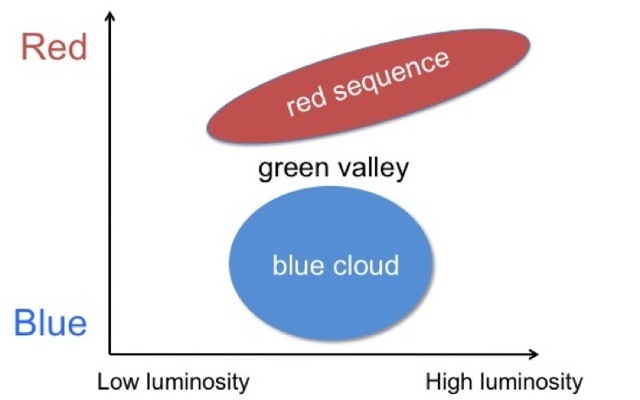 At higher galaxy density, the relative populations of red and blue galaxies shifts: there are more high-luminosity red galaxies which is consistent with a transformation from blue sequence to red sequence.